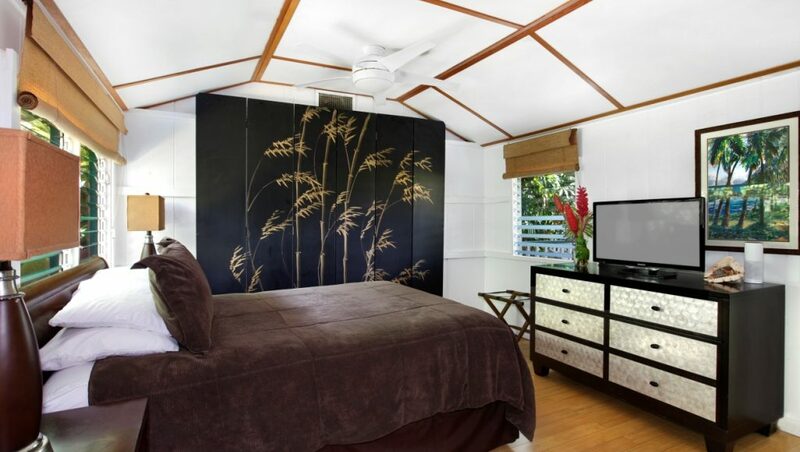 With its comfortable furnishings and private lanai, Canal Cottage B invites you to kick back and relax in true Hawaiian style, i.e., without an A/C. At $180 per night, it’s also one of our budget-friendly vacation rentals. Originally constructed in 1953, Canal Cottage B has been fully renovated. This vacation rental features bamboo accents, sustainable wood floors, vaulted ceilings, a tiled shower, and a café set. A ceiling fan and strong cross-breeze will keep you cool throughout your stay. This unit does not have an A/C but we have other units available that have A/C. The private lanai is just outside the front door, and overlooks the tropical gardens that surround the vacation home. With its two wide chairs and table, it’s the perfect place to savor your morning coffee while watching the sunrise. Canal Cottage B has a fully equipped kitchenette, making the unit best for short or long stays. The amenities includes a convection hot plate, microwave, mini refrigerator, rice cooker, blender, electric kettle, coffee maker, and toaster. You’ll also have access to the gas grill in the garden. With its private lanai and spacious interior, Canal Cottage B is a perennial favorite among guests to Kauai. Reserve your dates today!